As delivered by the Head of the Delegation, Mr. M. Hassan Soroosh Y. At the outset, please allow me to express my sincere congratulations to you and other members of the bureau on your election during this 25th Session of the Commission on Crime Prevention and Criminal Justice. I am confident that under your able stewardship, our deliberations in the framework of this year’s agenda will yield successful outcomes. I would also wish to thank the Secretariat for the timely preparation of the documents and for the excellent arrangements. Let me also thank the distinguished panelists for their excellent presentations, sharing their views on the topic. This year’s thematic discussion is very timely and highly relevant to our collective efforts towards international peace and stability. Countering terrorism as an important area of focus within the United Nations including under the Crime Congress and the CCPCJ remains one of the most pressing issues of our time. Terrorism in its various forms and manifestations continues to threaten the security and stability of our societies with associated huge loss of lives as well as damages to infrastructures, resources and the overall economic growth and development. The recent terrorist attacks across the globe are testimony to the fact that terrorism recognizes no boundary, religion or nationality and remains transnational in its nature. Evidence also shows a growing link between terrorism and various forms of organized crime including illicit narcotics, in some parts of the world, adding to the complexity of this menace. For many years now, Afghanistan has remained the prime victim of terrorism and the battle front against this menace. Afghanistan continues to pay the highest price and to sacrifice and suffer the most in fighting terrorism. Every few days, dozens of innocent people including women and children lose their lives in various forms of terrorist attacks in Afghanistan. In a recent single terrorist attack in Kabul on April 19th, more than 60 innocent people lost their live and over 300 people were injured, among them many women and children. On its part, the Government of Afghanistan has undertaken a broad set of efforts over the past few years – including under the justice sector reform – to improve the institutional and legal frameworks required for effectively countering terrorism. Along with accession to the United Nations Convention against Transnational Organized Crime (UNTOC); the United Nations Convention against Corruption (UNCAC) and the three drug-related conventions, Afghanistan has also joined an increasing number of international counter terrorism instruments. The enactment of the new Law on Combating Financing of Terrorism, the new Anti-Money Laundering and Proceeds of Crime Law as well as the new Law on Extradition are recent examples of our efforts in the area of legislation. Furthermore, the institutional and operational capacities in countering terrorism in Afghanistan have considerably improved over the past few years, including the capacity of our National Security Forces. The Government of Afghanistan also attaches great significance to judicial cooperation at various bilateral, regional and international levels and has recently signed extradition agreements with a number of countries in the region. As has long been argued, combating terrorism can only be effective when it is pursued under a comprehensive, integrated and balanced approach and in this context, addressing socio-economic factors; financing of terrorism, terrorist sanctuaries as well as the growing links between terrorism, narcotics and other forms of organized crime should remain on top of our counter-terrorism agenda at all levels. Many terrorist groups continue to enjoy safe havens where they are trained, financed and equipped. Addressing the socio-economic factors including poverty is crucial in countering the appeal of terrorism. In particular, youth unemployment that creates a sense of marginalization conducive to extremism and subsequently exploitation by the terrorist groups needs to be addressed. Therefore, security and law enforcement measures need to be taken along with measures to promote development and social inclusion. Given the transnational nature of terrorism, international cooperation remains key in addressing various aspects of terrorism and in this context, we believe that the efforts by the United Nations Office on Drugs and Crime and by Member States need to be further integrated and coordinated. Intensified efforts are required to strengthen border cooperation, information sharing and judicial cooperation including in the areas of extradition and legal assistance at sub-regional, regional and international levels as well as to improve the capacity of the criminal justice officials with a view to respond more effectively to the threats posed by and challenges associated with terrorism. As highlighted in the Doha Declaration, counter-terrorism capacity building remains crucial in addressing this menace including in the implementation of the relevant international instruments. We highly value the Joint Plan of Action between Afghanistan and UNODC’s Terrorism Prevention Branch (TPB) for the Implementation of Technical Assistance Activities to Support the Efforts of Afghanistan in the Area of Preventing and Combating Terrorism as an important technical assistance framework for strengthening the legislative and institutional capacities to prevent and combat terrorism in Afghanistan. Areas under the Joint Action Plan, namely the protection of victims, countering the financing of terrorism as well as fighting Improvised Explosive Devices (IEDs) are among the important priority areas in these counter-terrorism efforts. Furthermore, work is underway to include important topics such as countering extremism and Foreign Terrorist Fighters (FTFs) in the next phase of the Joint Plan of Action. In conclusion, let me reiterate that we appreciate the approach being pursued in the provision of such technical support which gives due attention to national ownership with a view to meet the specific needs and priorities of Governments in preventing and combating terrorism. From February 25 – 26, 2016 the Organization for Security and Co-Operation in Europe Parliamentary Assembly held the 15th Winter Meeting at the Hofburg Congress Centre in Vienna. In attendance to the meetings on behalf of the National Assembly of Afghanistan were Mr. Haji Mohammad Abduh and Mr. Fazil Azim Mujadidi, members of the Lower House of Afghanistan and Ms. Amena Afzali and Ms. Aziza Musleh from the Upper House. During the session of the General Committee on Political Affairs and Security, the delegation of Afghanistan delivered a statement on the importance of counter terrorism efforts. It was noted that as terrorist networks are interconnected at both regional and international levels, it must be addressed through coordinated, collective and sustained efforts at all levels, including a special focus on countering the financing of terrorism and dismantling safe haven for terrorists. 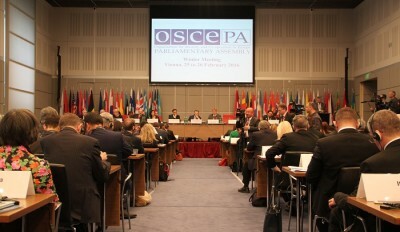 It was also stated that Afghanistan remains grateful for the invaluable support received from regional and international partners, particularly the OSCE Participating States and Partners for Co-Operation and that the OSCE Parliamentary Assembly is particularly well placed to provide a good platform for parliamentarians across the OSCE region to discuss and collaborate on counter terrorism efforts. A statement was also shared on the second day by the delegation of Afghanistan at the Joint Session of the three General Committees. The statement included an overview of the progress made in Afghanistan in the post-Taliban period for improving the situation of women in Afghanistan as well as the importance of the current constitution which established equal rights and access to justice for all citizens. Further achievements include the establishment of the Ministry of Women’s Affairs and the National Action Plan on Women, Peace and Security. The statement noted that while there is still much progress to be made towards the full realization of women’s rights in the country, the National Assembly of Afghanistan is committed to taking an active role in overcoming challenges. The importance of the support of the OSCE Parliamentary for providing a greater opportunity for the exchange of views and experiences was also highlighted in the statement. During the OSCE Parliamentary Assembly, the delegation of Afghanistan held several bilateral meetings, including with the President of the OSCE PA, Mr. Ilkka Kanerva and one of the Vice-Presidents, Ms. Christine Muttonen. In addition to this, the delegation met with a Member of Parliament of the Austrian Lower House, Ms. Gisela Wurm, who chairs the Gender Equality Committee. The delegation also had the opportunity to meet with the OSCE Secretary General, Ambassador Lamberto Zannier, as well as the OSCE Parliamentary Special Representative on Gender Issues, Dr. Hedy Fry. Further information on the session can be found here.